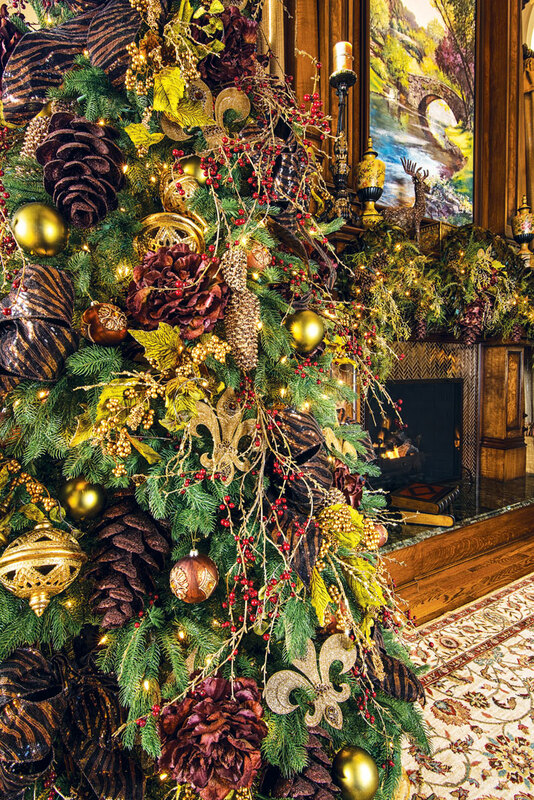 FOCAL POINTS | It’s important to create focal points on the tree “so the eye reads the story rather than trying to process a buffet of items,” the designer says. 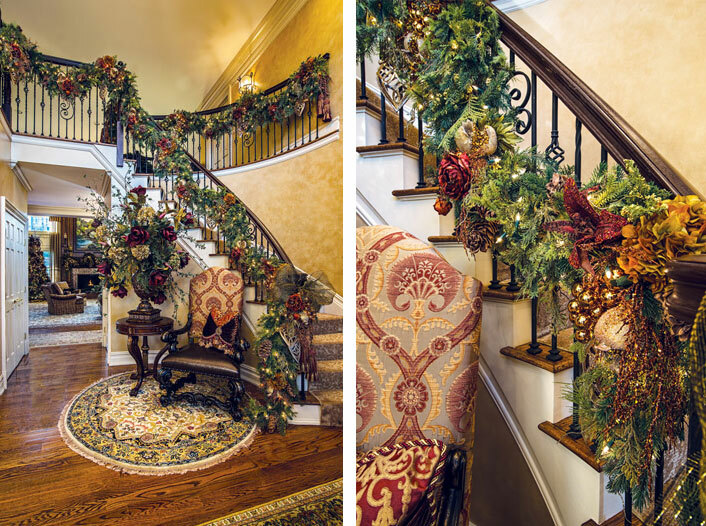 FOYER | Swags of full and decadent garlands on the foyer’s wrought iron staircase incorporate nine different elements woven together by hand to customize the look: two types of cedar garlands, a variety of flowers and jeweled pomegranates. “Glass grape bunches offer up a touch of opulence, while open pierced ornaments add relief,” Eror says. KITCHEN STAIRCASE | Two types of cedar vines entwine a burgundy and green floral garland on the kitchen staircase. Father Christmas and Three French Hens— collec­tibles from Katherine’s Collection—add whimsy and movement. A tapestry stocking, tassels, bells and custom mesh bows complete the look. Thanks to strategic wiring, “no spiraling greens around the banister means the clients get full use of the handrail,” Milena Eror says. 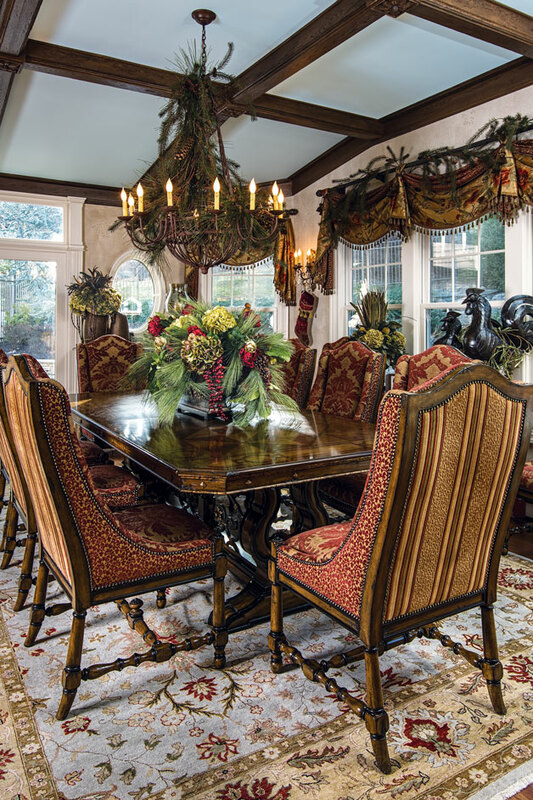 BREAKFAST ROOM | Draped greenery on the silk window treatments and chandelier bring good tidings to a breakfast room off the kitchen. The classic floral arrangement is changed seasonally. 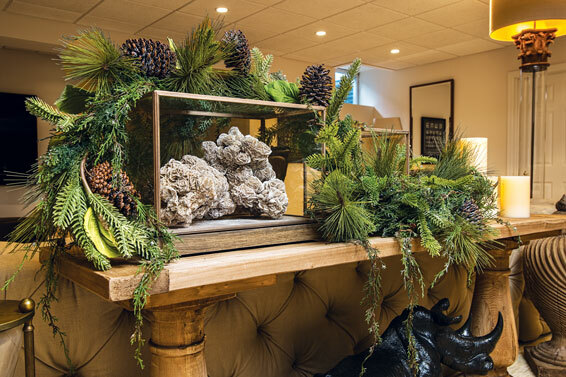 FAUX REAL | A natural looking combination of greens surrounding a terrarium adds winter flair to a tabletop without the glitter, the designer says. POWDER ROOM | “Powder rooms are a terrific place to have fun with color,” Eror says. She indulged the owner’s love of red. 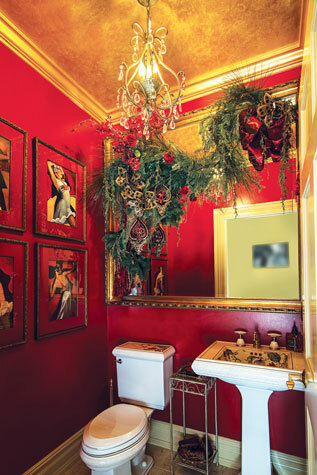 On the mirror, a pine garland is draped over an upside-down glittered cone securing red orchids and roses, winter greens and festive decorations in an offset two-piece design. Seasonal flourishes play up the scale and color scheme of a grand Bergen County, New Jersey home. The holidays can be magical, but they often come with a long list of obligations or to-do’s: shopping, running errands, traveling and entertaining. 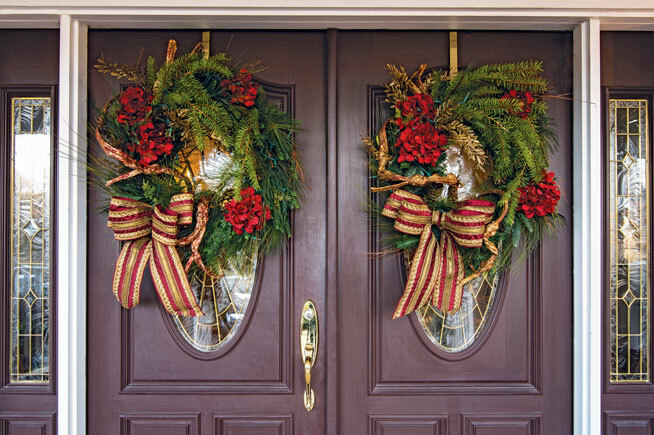 Creating that holiday magic at home may only add to the hustle and bustle. For homeowners short on time or energy or who need to focus on other pursuits, design professionals can ease that stress, add a special flair and tend to the tiniest details. 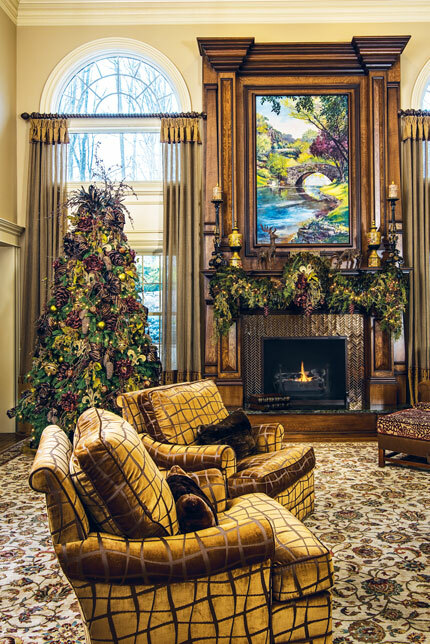 In addition to designing the interior of an upscale Mahwah residence, Milena Eror of Ivanka’s Home in Wyckoff, NJ had the pleasure of returning three years running to plan the holiday design scheme around the home’s Old World aesthetic, warm wood textures and lush fabrics. Each year, “we may add a thing or two or tweak a theme,” the designer says. If the family hosts both Thanksgiving and Christmas, the designer will either tailor a look that can suit both or do the decorating in phases, adding Christmas-specific items later in the season. “It’s nice to have a festive space for guests, but my clients really look forward to enjoying it all season,” says Eror, who offers personal trunk shows to preview this year’s collection of exclusive greens, ornaments and custom bows. 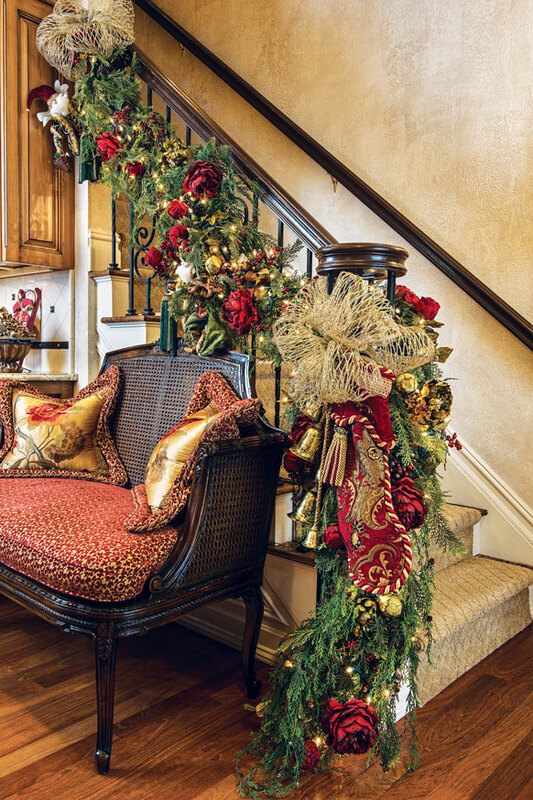 Pick one area that you want to decorate to the nines, such as a hallway banister, and do it well. Dress the garlands before you hang them. Put an individual strand of lights on last and get a remote control to light up different decorations with the click of a button. Ditch the ribbon—go with bows. Weaving ribbon through a tree is probably the most time-consuming task that rarely ends well, and you can’t reuse it the following year because it looks like a 1980s crimped hairstyle. I custom make my bows and incorporate them as focal points in trees, banisters and wreaths. If you store them lightly in a rigid box, they’ll have shape and bounce for years. Don’t make it look like Father Christmas sneezed his spirit everywhere in your house. Create focal points. Do them well. And then stop. Consider using magnolias or burgundy hydrangea instead of more generic red poinsettias. Steer clear of the dreaded “sampler” tree. It’s great to pick up single decorations here and there, but if you want to make an impact, commit to a color palette and incorporate enough of each ornament to create repetition. This gives the tree unique style and the ability for you to feature a different design scheme in an adjoining room. If you have sentimental ornaments, place them prominently after giving the tree its signature style. Interior design, artificial tree and other holiday décor, Ivanka’s Home in Wyckoff.Great Room: Swivel chairs in cut velvet, homeowner’s own. Foyer: side table, Maitland-Smith Furniture Industries; chair, Ambella Home Collection Inc. Kitchen Staircase: settee, John-Richard. Breakfast Room: table and chairs, Marge Carson Inc. upholstered in fabric by Lee Jofa and Stark Carpet; table centerpiece, Ivanka’s Home.